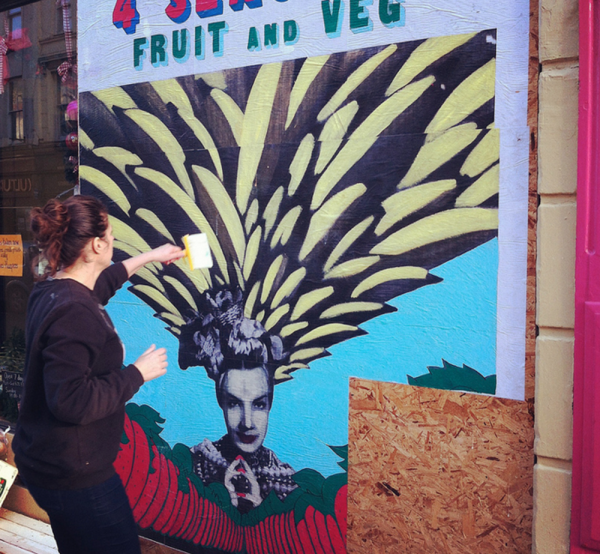 Shuby’s street art began in 2006 with work inspired by the singer and dancer Josephine Baker, illustrator Martin Sharp and film maker Busby Berkeley’s, ‘Lady In The Tutti Frutti Hat’. The common motif of the three being the banana. Shuby has pasted her collaged posters in many destinations around the world from cities like New York, London, Paris and Sydney to abandoned worlds of Doel, Belgium and Teufelsberg spy station, Berlin. Her banana and bunny motif have become a naughty but innocent calling card, instantly recognisable and intrinsically humorous. She currently has a studio in Hastings where she continues to paint, make print editions and work on commissions.